For other running routes, see Route List. And if you're interested in an essay on what makes Berlin so special, take a look at this Ode to Berlin, written in the transition days after the Wall came down. This route will explore the western side of Grunewald -- the bigger, hillier part -- located between the Avus freeway on the east, and the large lake, Wannsee, on the west. This is a great place for heading out for long runs on summer evenings, racking up kilometers with a few good hills. It will begin at the same place as the other Grunewald run, at the Grunewald S-Bahn station. But this time, we'll take the pedestrian tunnel under the train tracks and freeway to the west side of the Grunewald woods. When leaving the tunnel, immediately curve off to your right, past the beer garden (hey, no stopping here yet!) on Dauerwaldweg, keeping the sports fields on your right. After the surroundings turn into woods on each side, the path runs into the Teufelsseechausee. There are 2 hills in front of you at this point. Turn right. After 200 meters, turn left onto the road going up through the parking lot, between the 2 hills. Turn right to curve up the steps to the Drachensberg hilltop. This is the place where every kite-flyer in Berlin brings their kites and flies them. There's a great view. You can see the left-over, now unused, American-military listening post on the other hill to the south, the Teufelsberg. NOTE: Click on this link to flickr to see an amazing image of the sun setting over Grunewald from the Teufelsberg. 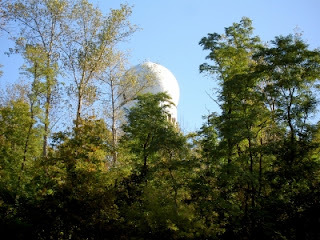 Now, let's run towards the Teufelsberg, following the paved street until you can get onto the smaller hiking path curving around the east side of the hill. The top of the hill is still fenced off, so you can't go to the top, but there are nice views, anyway. From the hill, run south, getting back on the Teufelsseechausee, toward the pond called Teufelssee (Devils Lake). There's another parking lot and nature center here, as well as a nudist beach, but we're out to collect kilometers, aren't we? So on we go, cutting around the lake on the east side, where the path branches off to the left. Keep going until you come to the Poststrasse, where you'll see a white milestone. 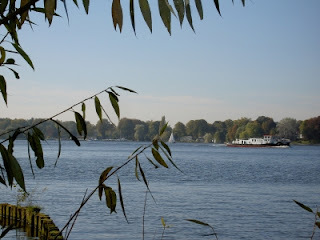 Just keep going straight there, for 2 kilometers going straight west through the woods towards Wannsee. 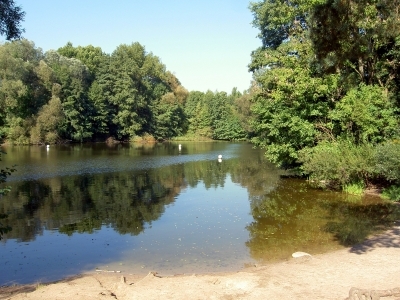 Just before the lake, you'll cross the Havelchausee lakefront road, and come to another hill, the Dachsberg. Keep going straight, around the east edge of the hill, and you hit the lake. What a great place this! You're suddenly standing on secluded beach, with sailboats out on the lake and woods all around, while you're supposed to be in one of Europe's biggest cities. Now you've deserved a swim, if you want one. This is about the halfway point. Now we'll head north along the lakeside, with the water to our left. You'll soon round a peninsula with a restaurant and marina, and continue along the water, with the road to your right. There is even a bus line out here, so if you feel beat, you can take a bus back to the S9 train station at Pichelsberg. A kilometer after the marina, you'll come to the floating lakeside restaurant, the ship Alte Liebe (Old Love). 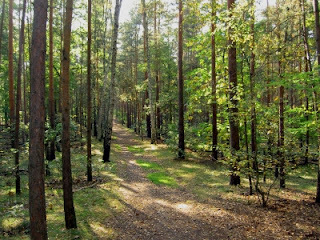 Here, we'll turn inland to cross the woods again to loop back to Grunewald station. Just about 100 meters BEFORE the Alte Liebe, turn right onto the road going to the British School. Take the path on the left that goes straight along the left edge of the school and just keep running straight for 1.5 km until you find yourself at the white milestone at Teufelssee again. This time we'll dispense with running up the hills again, and just follow Schildhornweg all the way to the the train station at Grunewald.